Having first experienced this iconic event as a spectator in 2014 it was one I was really excited to compete at in 2018 – it’s just spectacular! I arrived in good time on race morning, having registered the previous day, and began setting up my gear in transition. The nature of the run course requires a mandatory kit list to be carried by each athlete so this was a new experience for me. I had a rucksack with a map, whistle, foil blanket and full body cover which I would put on with my socks and trail shoes in T2. With everything set up and the mount/dismount lines clarified I checked my route through transition and had a short warm up jog before we listened to the briefing. By the time the briefing finished I was comfortably in my Arena wetsuit and as one of the ‘white hat’ first wave I headed to the water. 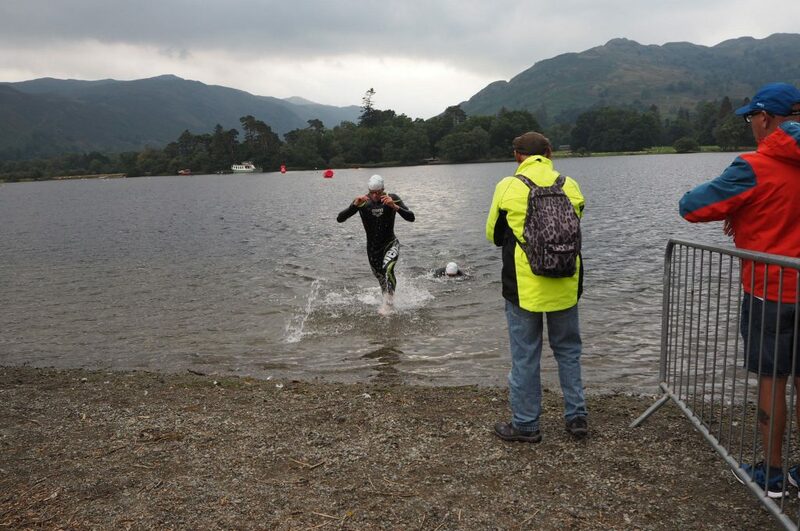 It was probably the coldest water I’d raced in this year, possibly with the exception of the Slateman Tri back in May – either way it certainly felt cold! The horn went and I got away quickly before settling to what felt like the right pace for the mile swim. There was one athlete pushing on so I slotted in behind him on his feet to get a draft, and as I half expected he had begun to slow down within a minute, so I edged past and carried on at my pace. I was aware that I had an athlete I knew following on my feet. 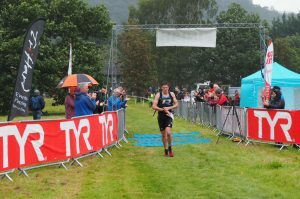 I knew Mark Duggan was a good swimmer having raced against each other at Keswick last year; round the first turn buoy I tried a little surge to see if I could get away from him but he stuck close so I decided to just concentrate on my swim which is what I did until the end. I was first out of the water and jogged up to transition, the top half of my wetsuit coming effortlessly off. I was soon out on the bike with my new disc wheel humming along satisfyingly. For the most part I was quicker on the flat sections and Mark was quicker on the climbs so after losing some time in transition he had nearly caught me by the time I reached Matterdale End. I was then pulling away again as I flew along the A66 towards Threlkeld. Some rough road surfaces and a headwind made the going tough through St John’s in the Vale and towards Thirlmere but I was building a nice lead. I was soon at Ambleside and starting the first steep ramps up Kirkstone Road. I focussed on trying to keep my intensity down and not push too hard as there was a long way still to go (both on the climb and in the whole race). About half way up Mark came past pushing hard – nothing new, I stuck to my pace. There was some great support on the final steep push to the top of ‘The Struggle’ and before long I was over the crest and building speed down the fast descent. I negotiated a few cars and a couple of motorbikes, and was flying along again on some nice tarmac, confident I could catch Mark again. Unfortunately there were some temporary traffic lights which we’d been told would be manually operated to allow us to pass through where possible, but I caught Mark up waiting at the lights. He’d been there around 30s and we waited another 30 or 60s before we were able to set off again. 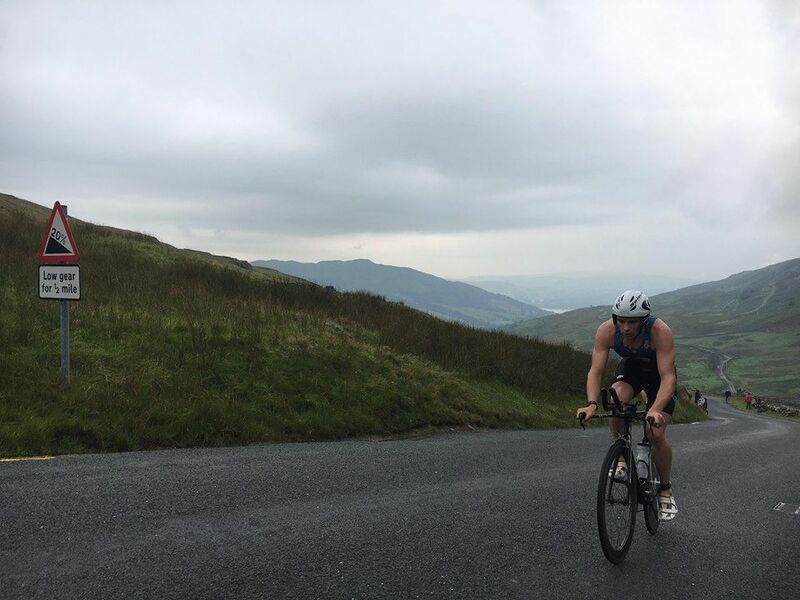 It was only a mile or two back to transition in Glenridding so I decided to let Mark lead and hung back in 2nd place. Another quick transition, despite socks and rucksack to put on, and I had leap-frogged back into the lead and set off at a steady pace to tackle the 9mile fell run. The first mile or so is slightly uphill with some flat sections so I thought about my cadence and tried to find my run legs and a rhythm. So far so good. You then hit the ‘steps’, the first steep part of the climb made up of hundreds of stone steps snaking up the grassy hill. I tried to settle into my own pace, and before long my calves were burning and my lower back began to ache. One step at a time! Mark came bouncing past me, and I was confident that he was going harder than he could maintain so I stuck to my plan and hoped he’d slow down at some point. We were soon up into the clouds and visibility wasn’t good which made it even more like a time trial in that you couldn’t see anyone you were competing against! I eventually made it past Red Tarn (you couldn’t see it, but I knew it was there) and up the final scramble to the summit of Helvellyn. Back into my running and I pushed hard all the way back to the finish line, battering my quads on the steep descent. I later found out I had pulled back over a minute on Mark, but finished just outside 2minutes behind him. I was happy enough with 2nd as Mark had performed well and simply out-climbed me! It was definitely a great (and challenging) event to do and a bit of a bucket-list raced completed so a podium position was a bonus, and hopefully my next race will feel very flat in comparison! A big thanks as always to Mark Egan and Egan Associates for sponsoring me for the season and to Solo Sports for supporting my swimming with fantastic Arena kit – the generous help is much appreciated!